"If you don't prepare for the worst, you won't be able to prepare for the future". So I posted this poll up, I would expect to be seriously attacked by people by this poll. So I leave it to for you to decide if I am a dark person or not, but I know I am not that kind of depressing person and also I am a person who likes to prepare for any situation (good or bad) and always thinks about the worst possible event imaginable to ensure they never happen. So, in this dark poll, I voted for Littlefoot for two main reasons; One, as (for most of the movies and T.V episodes) the central character, loosing him could possibly destabilise the rest of the series (assuming it ever continues). Second and more importantly, (in the context of a section), as the Section Commander (SECO); Littlefoot's position is vital for the continuity and stability of the section, If he dies, then the safety of the rest of the section is possibly compromised. This would obviously be a problem in the Great Valley, but if that situation occurred to the gang deep in the Mysterious Beyond: its now a life or death situation. However, in that section there would be a Second in Command (2IC) to take over the leadership position in such a event. In my opinion, the money for who that would be would be Ruby; she is the eldest of the gang, with near or at the level of leadership experience that Littlefoot had, she knows the level of responsibility required in this event and she could confidently lead the rest of the gang back home. Cera is too self-centred and overconfident, Ducky is too gullible, Petrie is prone to panic and can't handle stress well under pressure, Spike can't talk, so can't relay his thoughts and his ideas and Chomper is too immature. If anything good could possibly come out of this is that if this were to occur, Littlefoot would finally be reunited with his mother! So there is always a bright side of every dark corner! I do hope this will never really happen though cause Littlefoot is my fav character and cutting him off will be a big nope nope nope. The way I see it Littlefoot is the one who keeps them together,if he passes away most likely they'll just drift apart knowing Littleoot was gone forever,they would not be able to handle the grief if everything they used to do with Littlefoot reminded them of him. I am a dark person,I do write dark stuff in a fic I wrote a while ago there was an event that did result in Littlefoot's death and the gang broke apart because the love just was not there anymore,Littlefoot was like the glue keeping them together and his death as like it was peeling off. Thankfully that was just fic and never actually happen and never well seeing as LBT gone less family and more pre-school with every movie and episode. Plus there would be his Grandparents reactions when they find out their grandson has died. I just cannot measure such matters as grief in case of somebody's death and decide whose death would be the saddest (therebey deciding for every other death to be "not quite as sad"). The topic as such is interesting though. We have (especially in the later sequels with their harmless sharpteeth) become very accustomed to the gang being able to do whatever they want to without any perceivable risk for them. It is for that reason that I have always been very impressed with the scene in LBT IX in which they pressume Mo to be dead. Even though he did turn out to have survived I always found that to be a very emotional and powerful scene. In one of the stories I thought up the gang has very good reason to think of Petrie as having been killed in a storm (of course in the end he isn't, but it would take a whole long story to bring him back). Petrie... I'm not sure... It'd definitely be a big impact, if Petrie dies. He's funny and adorable...and sometimes his flying abilities are very useful for them, though, e.g. in LBT 9.
imo Littlefoot is the one, whose death would be worst. The votes, which are done so far, show that well( 4 LF 1 Ducky) Since Ducky is my favourite character she'd tie with Littlefoot. I'll vote for Ducky because she's the one, whose death would hit ME worst. For the gang, Littlefoot is the one, whose death will be worst. I voted for Ducky because that would also be my reaction, same as Ducky's (not the LBT Ducky ) response above. Since Ducky is such a well-liked character with hardly any haters (at least that I'm aware of) I'd say her death would be the biggest blow to the Gang? Who would resound the cheerful "yep, yep, yep's"? Who would make the movies instantly brighter just by her presence? @Malte: oh, that picture... why would you inflict such a premise on me? LBT without Panicky Petrie? Nuuuu! I saying Littlefoot,not for the reasons of the gang but for the reason he is the last of his line. He something happens to him before he can... you know the whole herd will die out. 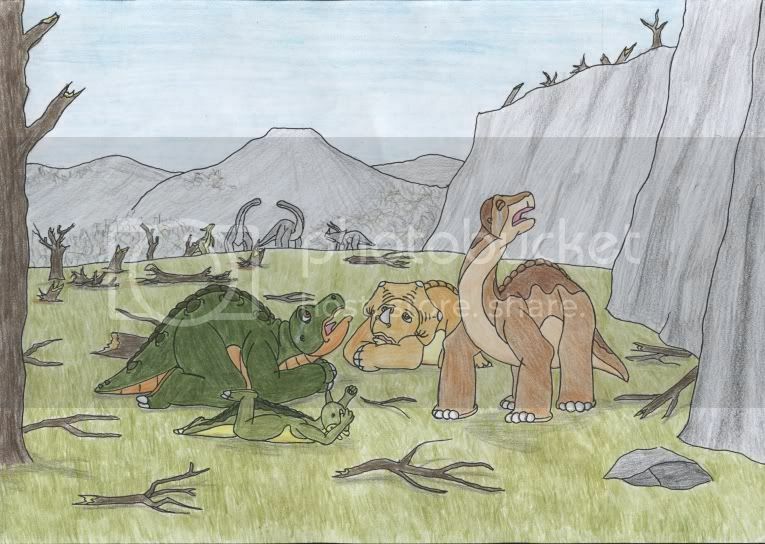 Which is quite tragic so not only would Littlefoot die but his whole family line. He is an only child so the only one who can carry on his family's blood. Plus just imagine his poor Grandparents reactions to the news..naw. Ducky would be tragic since her first voice actor died only 10 years old and it would be like a reminder of that. I honestly can't even cast a vote, because I believe that all of their passings would be equally tragic. For those who think the Gang would fall apart without Littlefoot, I beg to differ. It would be sad, and the Gang may take a while to adapt, but this happens to all of us sooner or later especially as we grow older. People close to us die, and we learn to move forward and live our lives but never forget about them. That's what I think would happen with the Gang too. I seriously doubt Cera would ever leave her friends. She may be stubborn, but she's also loyal. She's proven in the past she would even go against her father's orders for the sake of her friendships, and I don't believe the death of a friend would change that. If anything, it would bring them closer than before, perhaps giving them a heightened sense of mortality and the realization that they really need to look out for each other. That's my two cents on this topic . I don't think I could put a peg on which would be the saddest because I think losing one of the group would alter the demographic in different ways due to each of the characters' different personalities. The gang all counterbalance and compliment each other so to remove one of them would tip the scales in a different direction. If Cera went, the gang might be a bit more reserved and less brash in their actions. If Ducky went, the caring and more loving nature of the gang might change. As interesting as the concept is, I think I'd hate to see one of the gang killed off. It's a bit of a cheap shock-and-awe ploy that, at this stage of the saga's lifetime, would generate more anger than anything else. We are too used to seeing the gang together and to break them apart now with a character death would not (in my opinion) come off as a welcoming event. If that were a viable option, it has long since past I reckon. Seeing Littlefoot die would be the saddest! He's the leader! So I'm not surprised that he's gotten the most votes. But if he did, at least he would be reunited with his mom. Haha I like how people only picked Ducky and Littlefoot. Ducky would be missed, because we would miss hearing her "Yep yep yep"s and I always saw Littlefoot as like the leader of the gang, as well as like the peacemaker. I would be gutted if any member was killed off, ( I hope people won't go crazy at me for this) but I voted Cera what with her been my favourite character. I'd just won't want to watch the films anymore if anything that bad happened to her If my favourite character in a TV show is written out or killed off, I lose interest in watching the show. One of the reasons I stopped watching pokemon was cause Misty (my favourite female character) left. Death of gang memeber definitely would be the most depressing thing. I would vote for Littlefoot, as he's protagonist and the most closest character to me. One time, when I thought about composing fanfiction, I earnestly was thinking about killing one of major LBT character. Yeah. It's sad that I still didn't finally decide what to do: to let this death happen or not. The most saddest thing: two weeks ago I decided to make Russian roulette. More than four dozens LBT characters and only one absolute random death shot. And guess who dies?.. Yeah... Do you believe in destiny?.. I'd probably say Littlefoot. Not only because of his role in the Gang but because of his Grandparents, Bron and Shorty. The Seven Hunters showed what the effects of Littlefoot's death and, damn, was that depressing. Also, he is his family's "last hope for the future". I don't mind character deaths in fanfics but in a film though? I really don't want to see any of the Gang die. It's unlikely that the producers could make that work but after all these years, I cannot come up with a fitting canon death. Of course, there's a chance that the producers could come up with some great idea which justifies a death in the Gang but I'm pessimistic that would compensate for that magnitude of loss. Maybe LittleFoot since he is the leader of the group and helps the group stay together. And also Petrie since he a good member of the group. I wouldn't think the group would be the same without him. There' short stories I read here in this year when character died. There are multiple stories in fanfiction.net: Journey of a Forgotten Past, Shattered Skies, Five Fallen, and A Lucky Day are some that I've read. The first two are normal-length stories and despite the deaths, I really liked them. Ah okay. I'm not even able to stay updated on those fanfictions posted on here so reading some on fanfic.net is out of option for me currently. How will death be dealt with?